America seems to Arun like the land of plenty—everywhere he goes, people have more and bigger material possession’s than he’s ever seen. The process of acquiring goods appears to be a big past time; Mrs. Patton is an expert at buying things, but once she brings it all home, she doesn’t turn her purchases into food. America has all the same basic staples as India– food, family, home—but in America, it’s all packaging with nothing nourishing. Mr. Patton’s reaction to Mrs. Patton shows his inability to accept his wife’s right to make her own choices. Even in America, men can still assert their will over women. Ballinger-Dix, Elizabeth. 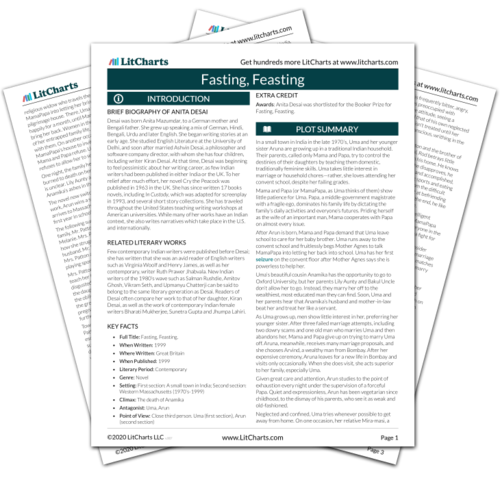 "Fasting, Feasting Chapter 19." LitCharts. LitCharts LLC, 7 Sep 2014. Web. 24 Apr 2019. Ballinger-Dix, Elizabeth. "Fasting, Feasting Chapter 19." LitCharts LLC, September 7, 2014. Retrieved April 24, 2019. https://www.litcharts.com/lit/fasting-feasting/chapter-19.